Peter Paul Solenoid Valves are electromagnetically actuated, direct operating, plunger-type valves with soft seals. Valves are bubble tight, have built-in safety factors and are capable of operating at less than rated voltage when full pressure is applied. They are built to Underwriters’ Laboratory (U.L.) standards, and most valves are U.L. and C.S.A. listed for media up to 105 F and ambient temperatures of 77 F. All except the high-pressure, impact-type valves may be installed in any position. The valves may be mounted directly to the line or by mounting holes provided on the bottom of the valve body. Housings can be rotated 360 degrees for versatility of installation. Seats are precision machined, assuring many cycles of trouble free operation. Peter Paul provides innumerable valve combinations. One may request ratings from vacuum to 3000 PSI, voltage ratings from direct current up to 400 cycles and from 1.0 volt up to 1000 volts, metering from one drop per minute up to gallons, and various other mechanical and electrical options. Contain bubble tightness, a smooth flow and provide quality you can trust. Delivery has evolved using Kanban. Where we can not flow we pull which allows the right amount of inventory to be in the right place at the right time. 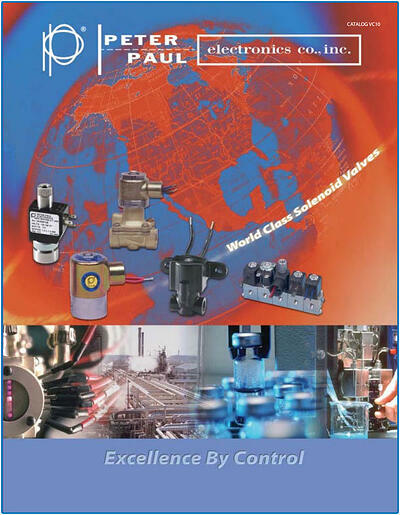 Peter Paul Series 20,30 and 70 solenoid valves offer a wide range of control options over the flow of liquids and gases in applications from dispensing to instrumentation, commercial equipment, machinery, medical/dental equipment, control systems and off-highway equipment, to name just a few. These Series are available in 2 and 3 way construction, in brass, stainless steel and plastic bodies, depending on the model selected. The valves can be used to control a wide variety of oils, water, solvents, gases, process fluids and steam. Super high pressure ratings with bubble tight sealing. Ratings up to 3000 psi. Peter Paul’s miniature, low-cost, high performance solenoid valve line is particularly adaptable to original equipment manufacturers in their development of fluid power and fluid control equipment. The Series 50, 15, and 58 valves can be found in medical and dental instrumentation, analytical and HVAC equipment.